Monosodium glutamate is a form of glutamate, a naturally occurring amino acid in the body. It is an additive content of many foods especially processed ones and recipes in fast food chains and restaurants. Monosodium glutamate appears like salt as a food additive. It is crystalline and white. It is also used in the fermentation of starch and some sugars. Glutamates effect in the body is beneficial as it excites the body cells to allow faster transmission of nerve impulses. Actually, it is a normal neurotransmitter in the body in which it is manufactured from glucose along with the other neurotransmitters such as aspartate and gamma amino butyric acid (GABA). All foods that are protein sources contain glutamate. Glutamates allow faster transmission of synapses when it is present in between a neuron transmitting the chemical impulse towards a receiving cell. The microscopic gap between these systems is called the synapse. Glutamates combine exclusively with specific proteins depending on the structure of their receptors in the surface of the cell that acts as transmission receivers or the post synaptic cells. The voltage then of the post synaptic cell that acts with glutamate is ‘excited’. The United States Food and Drug Administration (FDA) considers the use of monosodium glutamate safe. Yet some people and health groups push through the contention that monosodium glutamate has its mild to severe adverse effects on the human body. Though its derivative is glutamate which is a naturally occurring amino acid in the body, its form is not that harmless to the body. Mild affectation of the body may include MSG sensitivity which may be experienced by some people. Health groups though that contends MSG to have deleterious effects in the body have no clear evidences that MSG is the cause of these abnormalities. Monosodium glutamate acts as an excitatory agent specifically to the nerves of the tongue and the brain, making it a potent flavor enhancer. For a number of years, people have associated symptoms that they experience to MSG, concluding that it is harmful. These symptoms commonly include headache, flushing, facial tingling, and sweating. Prevalence of MSG allergies is recently detected. Some studies report broad symptoms that are short term while some studies present long term MSG effects such as Alzheimer’s disease. Most scientists believe that MSG is metabolized in the body as the same form of glutamate that poses no health risk. Still, at present, physiological processing of MSG as glutamate still remains indefinite. The exact pathophysiology why MSG can cause hypersensitivity is still to be discovered. In some observatory studies, allergic reactions that occur after MSG ingestion take place only if the person ingested a significant amount of monosodium glutamate. Otherwise symptoms are not experienced. This may be the only basis liking the allergic reaction to MSG. Foods that contain high amounts of MSG cause the allergic symptoms. These symptoms may not be abrupt and may occur after a time. Individuals with a heredofamilial history of allergy and bronchial asthma are most likely the victims of MSG sensitivity attacks. Allergic reactions are a type of immediate hypersensitivity reactions classified under type 1. They are also considered disorders of the immune system. Since the disorder is already present, MSG triggers the body to react severely to the harmless allergen. MSG allergy is due to a disorder of the immune system which causes the defense factors to overreact against some toxins in the environment, which are called allergens. In this case, the monosodium glutamate in foods is considered the allergen. Signs and symptoms of MSG sensitivity may be mostly subjective. People with this kind of sensitivity complain of recurrent headaches after ingestions of foods with high amounts of MSG. They may also complain of chest pain with slight difficulty of breathing, which are also signs and symptoms of angina. Comprehensive assessments are very critical in this kinds of symptoms since disease with the same manifestations can be fatal in a matter of minutes. Drowsiness, nausea, and vomiting may also be a common symptom since ingestion directly involves the digestive tract. When the body is sensitive to the food, intestinal spasms tend to dispose the food off from the digestive tract. Diarrhea then is also a common symptom. Tachycardia or a significant increase in the heart rate above normal is experienced as a common sign of hypersensitivity reactions. The person may also experience fatigue and weakness. Burning sensations in the buccal area going down the throat is experienced upon swallowing of the bolus or the food digested through the mouth. Facial pressure, numbness, or tightness is also sensed. Tingling and numbness of peripheral areas especially in the upper and lower limbs may alarm the patient, since these are also symptoms of Vitaimin B deficiency and in some cases, of impending brain attack. Diagnostic tests that would rule out allergic attacks against neurovascular disorders are much necessary. The symptoms commonly appear after a short time following a person’s meal with high MSG content. In very few cases, people report onset of migraine everytime MSG high foods are ingested. Cases of seizures are rarely reported. Mental affectation, such as alterations in level of consciousness and depression are also reported but still with no evidence that they are connected to MSG ingestion or sensitivity. 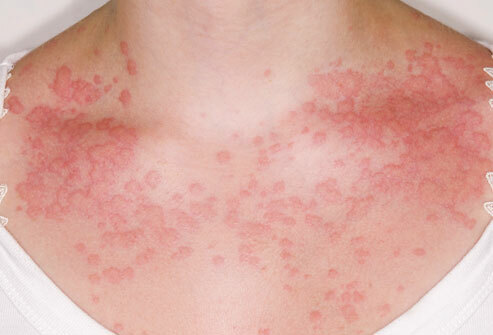 Itchiness or hives sometimes appear generally in the body but the real etiology is yet to be ruled out. According to the Food and Drugs Administration in the United States, these people who tend to overreact physiologically from MSG are classified as “MSG-sensitive” or MSG intolerant. MSG syndrome complex is a term coined for persons who are suffering gravely due to MSG intolerance. Varied and numerous symptoms might be present with these persons such as those stated above. The syndrome is also pertained to as the “Chinese restaurant syndrome” since Asian fast foods and restaurants tend to utilize high amounts of MSG as food additives in their recipes. Reports of exaggerated hypersensitivity reactions are also reported immediately after ingestion of MSG up to 48 hours after eating an MSG-rich meal. Ingesting MSG on an empty stomach may also exaggerate the symptoms in MSG intolerant persons. There are still no specific diagnostic test and treatments for MSG sensitivity. It is best that the person who might be prone to MSG hypersensitivity should be knowledgeable on how to prevent the allergy attack. It is advised that allergic persons should avoid products that contain high amounts of MSG such as packaged and processed foods. Eating in fast food chains should also be avoided. If not, possibly allergic persons should first inquire about the ingredients of foods in restaurants or fast food chains to provide them information on what foods to avoid. Or they may request that the food they order should not contain MSG. product labels should be read consciously for high MSG content. There are also some food additives that contain glutamate, in which a person allergic to MSG might also exhibit same allergic symptoms when foods with these additives are ingested. These additives would include monopotassium glutamate, sodium caseinate, maltodextrin, modified food starch, autolyzed yeast, and hydrolyzed proteins. MSG is not only present in processed foods but also in some dietary supplements, medications, and cosmetic products.